One of the easiest online casino games to understand and one of the most popular to play, roulette, offers lots of exciting action. 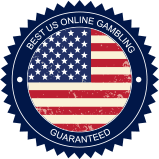 There are two common versions of online roulette - European and American. European is preferred over the American version. That’s because the European roulette wheel has one zero, while the American wheel has a zero and double zero. That additional zero on the table and wheel greatly enhances the casino’s advantage without offering the bettor a higher payout. The European wheel has 37 numbers and the American 38. That one additional number takes the house edge from 2.7% in the European version and ups it to 5.26% in the American. In addition to European and American roulette, you may find no zero roulette at certain online casinos. This version of the wheel, which can only be found online, eliminates the house edge completely, greatly increasing your chances of winning. If you can find no zero, play it. One of the reasons that roulette is so popular is that of all casino games, the payout is substantial for hitting a single number. You win 35 to 1 when a single number bet is won. Of course, it’s tough to pick that one number correctly, which makes some of the many other types of bets in online roulette that carry less risk more attractive. These include various even odds wagers. The roulette table at which you play will have a prescribed minimum wager. All bets must be placed prior to the spin of the wheel. Once the wheel stops spinning and the ball finds a pocket, the house pays winners and takes in losing bets. It’s then time to wager on the next spin of the wheel. There are various types of bets that you can make when playing online roulette. These are categorized as either inside or outside bets. Inside bets have fairly high odds, while outside bets offer much lower odds, which means they are easier to win. The inside bets in online roulette are all of the single numbers, including zero and double zero. You may wager on these numbers in a few different ways and each manner carries certain odds. When you wager on numbers individually, you’re paid 35-1. You may also split your wager, betting on any two adjacent numbers. This has odds of 17-1. There is also the corner bet where you put money on any four adjacent numbers. This pays 8-1. Wager on a row of three numbers and you’ve made what’s called a street bet. Street bets pay 11-1. When you wager on two rows of numbers, six total, that’s known as a line bet. The odds when you wager the line are 5-1. As stated, the inside bets carry relatively high odds while the outside ones offer players lower payouts but more safety in terms of a bettor’s ability to hit them. Of course, nothing is guaranteed when you play casino table games. There are a few bets that offer 1-1 odds. These include the high and low wagers, with 1-18 being low and 19-35 qualifying as high. You may also wager on a color, red or black, or even/odd coming up. Each of these is 1-1. There are three different dozens you can play and each pays 2-1. They are 1-12, 13-22 and 23-35. Column bets also carry 2-1 odds and are placed at the bottom of each column. On the next spin of the wheel if zero is hit again or you simply lose the bet and your wager is lost, but if you hit the bet, your original wager is returned with no further payout. Play at casinos with the En Prison rule if you can because it lowers the house advantage for outside bets to 1.35%. That’s a real deal. There are various strategies for betting on online roulette. One dictates that you primarily play outside wagers, working slowly to build up your bankroll and doubling down after you hit four in a row. Once you miss on your wager, you return to making the minimum wager. This is a fairly passive method. But it is less risky than simply wagering on single numbers. Another strategy has to do with playing the same wagers consistently and spreading your bets out across the board. With this type of strategy, you would place four inside wagers comprised of two corner bets, a split bet, and a single bet. That’s a total of eight bets. You would also place one outside wager. Each would be played at the minimum. If you win any of the inside bets, then you would double up on that particular wager. If you win again, then double up again. As soon as you lose, you go back to wagering the minimum. With this strategy, you are spreading your bets out around the roulette wheel, which gives you a much better chance of wining. You’re covering a total of 11 numbers with your inside bets. That greatly increases your odds of hitting a number, much more than if you placed four bets on single numbers. When playing online roulette you must practice solid bankroll management . Determine the amount you’d like to risk in one session of play. Once you have decided on how much you’ll spend, divide it into unit bets. Depending on the strategy you use, you will be making anywhere from one to ten different bets. If you decide to go with four inside wagers comprised of two corner bets, a split bet, and a single bet, plus one outside wager, that’s nine bets, you’ll need at least $9.00 per turn. If you have $100 to wager with, you’ll be betting nine units per spin of the wheel at $1.00 each. That gives you a total of 11 bets for the session before you run out of cash or must win. You may want to increase your number of spins by making $4.00 in bets per spin, giving you 25 turns at the wheel. In doing so, you may start by playing bets that offer midrange odds and once you win a few and build up your bank a bit, add a high paying single number wager. If you do win, become more aggressive with your wagers while also protecting some of your profit. With roulette, you can win a lot quickly and lose your winnings easily. Walk away when you’re ahead so that you can play again tomorrow. Online roulette is one of the most popular casino games around. Limit your wagering and play bets that overall carry less risk. Remember that all results of roulette are random and there’s no way to figure out what number that bouncing, little silver ball will land on next. Enjoy the game; it’s a lot of fun!